First Sentence: Hazel Motes sat at a forward angle on the green plush train seat, looking one minute at the window as if he might want to jump out of it, and the next down the aisle at the other end of the car. For several years now I've known of Flannery O'Connor as the devout Catholic lady writer of Southern Gothic novels and short stories who died too soon. As you may know if you've been reading this blog for any length of time, I will never get enough Catholics (for better or worse), so of course my interest was piqued. 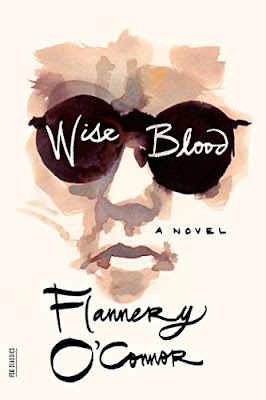 Wise Blood is the first writing of O'Connor's that I've read, though. Although it left me somewhat perplexed, I will be returning to read more eventually. Wise Blood is the story of Hazel Motes, 22 years old, veteran of what is most likely World War Two, although I couldn't help feeling as though the book was set in a much earlier period, for reasons I will soon elaborate on. Hazel is on the run from God, who appears to have haunted him for his entire life. He wants to stop believing, and does his best to blaspheme along with those who truly don't believe, but finds that the mere fact that he considers this blasphemy proves he is still a believer. The actual events of the book involve Hazel meeting an even younger man named Enoch Emery, who works at the city zoo, hides in the bushes beside the public pool, and has all sorts of interesting habits. Enoch also possesses the "wise blood" of the title, although I don't think I could tell you what wise blood is supposed to be. Hazel and Enoch meet when they encounter a preacher named Asa Hawks and his daughter while all three are in the crowd observing a street vendor selling a potato peeling device that I'm sure does not work. There are some items I could add, but the fact is that they were listed on the back of my copy and spoiled some of the delightfully weird surprises this book contains, and I'd hate to do the same for you. So first off I must say that O'Connor creates a very vivid and tangible world in this novel. There's such an overwhelming sense of poverty and dirt and tragically skewed family dynamics and God knows what else. A deep, dark sense of malaise? Oh yes. It read to me as though it were taking place in some undefined time in the past full of lawless wanderers and vagrants, although describing Hazel as a veteran situates it in a specific time. I thought there might be some chance that it was about the post-WWI period but Hazel's been away for too long for that to be the case. O'Connor's prose is the straightforward kind that takes some getting used to at first and then eventually just hammers directly into your brain. Everyone's face is a different shape. Secondly, the only book I can think of with better character names is The Outsiders. "Sabbath Lily Hawks" carries the day here, with "Onnie Jay Holy" (real name: Hoover Shoats) being a close runner up. The characters are all as unique and perfect as their names. Hazel is possibly the angriest protagonist I've ever encountered in a book but he also shows his youth in the kinds of decisions he makes. One thing the text itself doesn't bother to explore explicitly is how his experience in the war has affected his personality, although it's obvious that that experience did have a significant impact on him. Enoch Emery is exuberant and creepy and totally lacking in self-awareness. Asa Hawks is... confusing. This book is exactly what I want from my Catholic fiction, in the way that The Heart of the Matter somehow wasn't. Hazel Motes has an impossible task: to prove to himself that he doesn't believe in a God that he can't stop believing in. Possibly my favourite thing of all is that we find at least one truly godless character in the book, who is not a bad person, and who is (blessedly?) free of Hazel Motes' struggle. I will leave it to you to discover how Hazel's task turns out. Wise Blood is not going to be to everyone's taste, but it was definitely mine. Enoch was usually thinking of something else at the moment that Fate began drawing back her leg to kick him. When he was four years old, his father had brought him home a tin box from the penitentiary. It was orange and had a picture of some peanut brittle on the outside of it and green letters that said, A NUTTY SURPRISE! When Enoch had opened it, a coiled piece of steel had sprung out at him and broken off the ends of his two front teeth.